Preparation time: 25 minutes. Cooking time: 50 minutes. Heat oven to 400°F. Wash and pat dry the eggplants, cut off their stems, and cut them in half vertically. Place them with the cut side down on a baking pan coated with nonstick cooking spray. Bake for 30 minutes. Remove eggplants from the pan, cool under running water, and pat dry. Using a spoon, carve out and chop the pulp, leaving just a thin shell (about 1/4 inch). Place pulp in a bowl and set aside. Cook the orzo according to package instructions, but keep it slightly undercooked (1–2 minutes less than directed). While the orzo is cooking, heat the olive oil in a medium-size frying pan over moderate heat. Add the garlic and sauté for 1 minute. 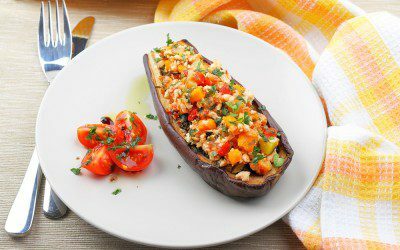 Add the chopped eggplant pulp and sauté for 4–5 minutes, stirring frequently. Add the tomatoes, dried herbs, and salt and pepper to taste. Mix thoroughly and simmer for 10 minutes. Remove from heat. When the orzo is ready, drain and add to the eggplant mixture. Toss in both cheeses and mix well. Divide eggplant–cheese mixture into 8 equal portions and fill the eggplant shells. Spray the top of each with cooking spray. Place stuffed eggplant halves on baking pan and bake for 10 minutes. Remove and serve immediately. Exchanges per serving: 2 1/2 starch, 2 medium-lean meat, 1 1/2 fat. Carbohydrate choices: 2 1/2.